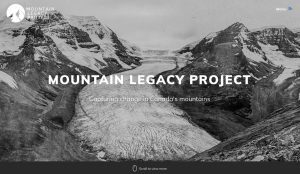 A new digital platform for the Mountain Legacy Project is born! On July 24, 2017, we launched a website and new logo that carry us forward. Our main aim is to communicate more effectively what the Mountain Legacy Project accomplishes, and to make this news accessible to a much wider audience. For those familiar with our earlier WordPress Blog, it is now our primary news feed (linked to social media, including our increasingly popular Facebook site). Brand new is a Gallery section that will display selections of images past and present to tell stories about our work, the work of historical mountain surveyors, and some of the technical work behind-the-scenes. Many thanks to Mary Sanseverino for creating the first three galleries. The new platform gives emphasis to the Work that we do at MLP, the gigantic image bank, Explorer (more than >7,000 image pairs! ), and new software, the Image Analysis Toolkit. I’m grateful to the team at Limbic Media for their expertise and creativity: Chris Gat (an MLP alumnus! ), Hilary Tabbernor, and Corey Slavnik. Trudi Smith, Mary Sanseverino and I sketched out what we wanted in the site. Members of the MLP group past and present helped to refine digital platform. We are grateful to sponsors and partners, especially Alberta Agriculture and Forestry, for providing key resources to bring this digital platform to life.